NOTE: This is a Amahi Netboot application. No Installation Needed - You don't have to install Redo Backup. And you don't even need to have an operating system installed. Just insert the CD or USB stick into your PC and reboot. Never reinstall Windows again! Boots in Seconds - The system boots in less than a minute, and all your hardware gets detected automatically. The system uses minimal space and resources, and the download size is less than 75MB. It's Pretty - Redo Backup provides a point-and-click interface with network access and a complete operating system (via the xPUD project). Maximize and minimize windows while your system is being transferred. Works with Windows or Linux - Some backup solutions only work with Windows, and some only work with Linux. 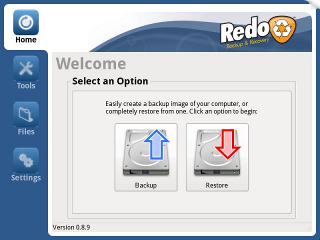 But with Redo Backup, you can save and restore all your machines using the same tool. Finds Network Shares - Redo Backup will automatically search your local area network for drives to backup to or restore from. You don't need to know any details about a shared folder or network-attached storage device. Access Your Files - Can't log in to your machine, but need files from it? No problem: just pop the Redo Backup CD in, reboot, and you can copy your documents to another drive (such as a USB stick). Recover Lost Data - If you accidentally delete a file or empty your Recycle Bin, simply shut down the computer and insert the Redo Backup CD to search the drive for the deleted files, and save them to another drive using Photorec. Easy Internet Access - Need Internet access to download drivers or read documentation? In less than a minute, you can boot off the Redo Backup CD and browse the Internet with Firefox. Factory Drive Reset - Before selling or giving an old PC away, be sure all personal or business data has been removed by using the drive reset utility. This ensures that no private information is left on the disk. Drive Configuration Tools - Graphically edit, manage, and resize partitions to take full advantage of your drive's capacity. Partition editing is provided by the GParted utility.